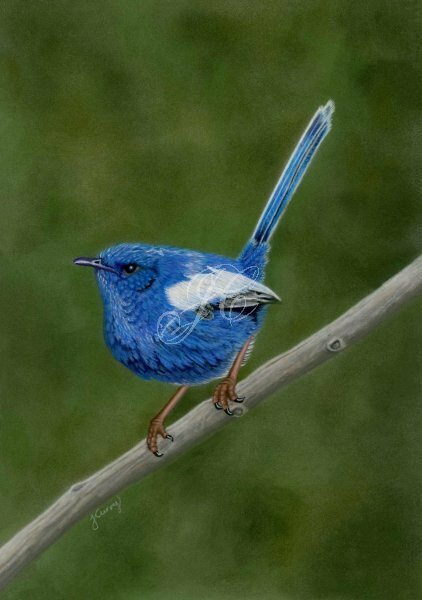 This is the ninth painting in my Fairy Wrens of Australia series. It features a male White Winged Fairy Wren (Malurus Leucopterus) perched on a branch. The White Winged Fairy Wren is a bright cobalt blue colour with a striking white wing. It lives in arid and semi-arid parts of Central Australia, from central Queensland and South Australia across to Western Australia. It likes to forage in low vegetation and is quite shy, making it a challenge to photograph. The subspecies Malurus Leucopterus Edouardi is only found on Barrow Island and Dirk Hartog Island, which are Islands off the coast of Western Australia, instead of being a bright cobalt blue in colour the males have striking black feathers with a white wing, the subspecies is classified as vulnerable. Artist quality Pastel Pencils and Panpastels (soft pastels) on Clairefontaine Pastelmat. Reference photo by Mat and Cathy Gilfedder. Size is 25 x 17.5 cm. Original Pastel Painting is framed and ready to ship as well as a range of Fine Art Giclee Prints are available in a range of sizes.